Despite the heat and my “delicate condition” 😉 , I made it through the Cycling Savvy Instructor training this past weekend! In fact, I didn’t just make it, I had a great time. Like the Cycling Savvy training itself, the instructor training was accessible for people of various fitness levels. 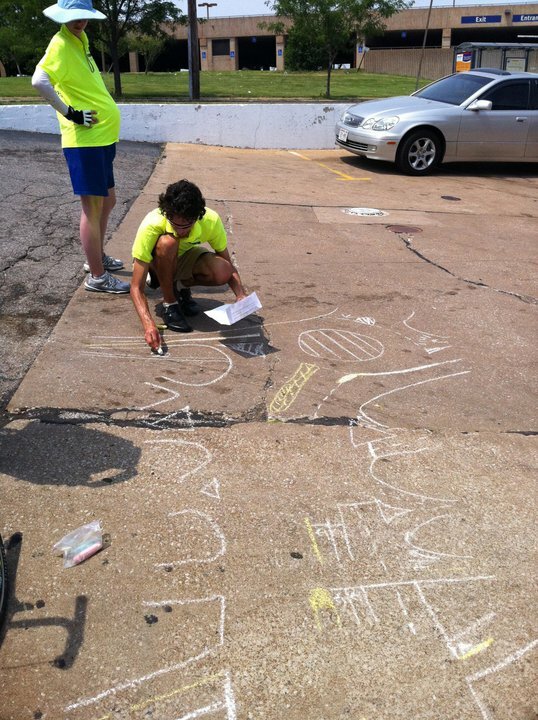 We covered over 14 miles on Sunday, but we did so over a 6-hour period consisting of easy-pace group riding, lots of breaks (in the shade) for instruction and “chalk talk,” plus a few individual exercises. You don’t have to be fast to be a confident, courteous, savvy cyclist! While portions of this route seem intimidating upon first glance, even for the seasoned road cyclist, Cycling Savvy provides the skills, information, and confidence necessary to navigate the features, breaking them down into manageable chunks for cyclists of every level. While it will be at least a few months before I am doing any instructing, there are Cycling Savvy classes available NOW in St. Louis. Visit the Cycling Savvy St. Louis page to find out more about the classes THIS Thursday and Saturday, which still have room for a few more students. The class provides the real world skills (and first hand experience) to help you drive your bicycle on the road, while interacting effectively, confidently, and safely with other road users. 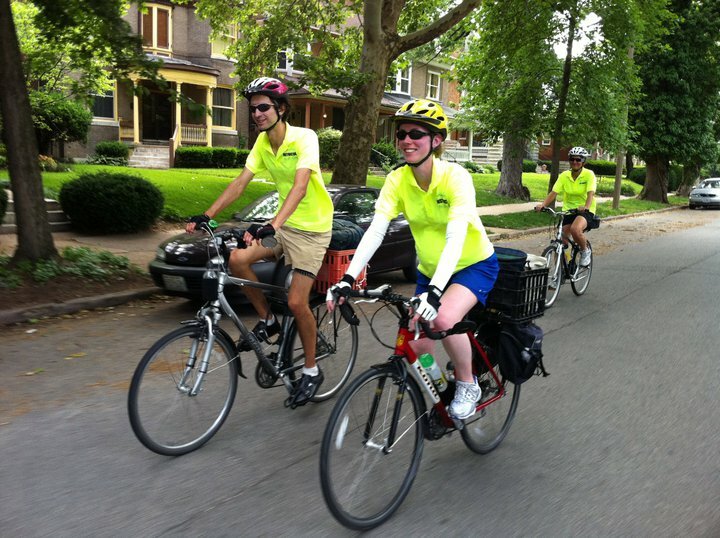 This entry was posted in Biking and tagged biking while pregnant, Cycling Savvy, saint louis. Bookmark the permalink. 12 Responses to Cycling Savvy Instructor! You rock! I’m so impressed with your ability to be out there and actively engaged in that heat in your “delicate condition.” I’m glad the temps were lower on Sunday. Saturday’s weather would have been unbearable in the afternoon. Great story! Thank you for posting. You are so totally going to be Exhibit A whenever we hear the myth that traffic cycling requires macho and brawn. I can’t resist telling you another pregnant woman cycling story. The late great Mary Jane Rioch, a bike racing star in the 1970s, had arranged with her obstetrician to ride her bike to the hospital once she went into labor. (Kids: you may try this at home only if your own obstetrician approves.) So there she is, riding through Philadelphia, when she catches up to a novice rider, using a slow cadence in his highest gear. She slows down, gives him a brief lesson on using lower gears and higher cadence, says, “Sorry, I gotta rush off and go have my baby,” and takes off, leaving the guy in the dust. Love the story. Thanks, John. If we weren’t planning a home birth, there’s a chance that would be me (minus the former racer part). Beautiful picture–I was lucky to find a cyclist midwife when I was pregnant for the first time 15 years ogo. The general advice I kept reading was no cycling but like you my main sources of transportation was and still is a bicycle and so of course I was in a position to easily adapt to the changes in balance. It’s pretty ridiculous that people question cycling while pregnant, but not driving an automobile, which is an equally, if not more, dangerous activity. One of my midwives also rides a bicycle, and she has been supportive of my continued transportation of choice. With the car seat enforced bad posture, the car is the LEAST comfortable place for me to be right now. Unfortunately, I have to be in the car 4 days a week 😦 But that’s all the more incentive to make trips by bike on the other days!